The Flash v. Quicksilver, Doom Patrol v. X-Men | Inspiration Or Ripoff? Welcome back to our third installment of Inspiration or Rip-off? So far we have looked at Deathstroke/Deadpool, Darkseid/Thanos, Aquaman/Namor, and Justice League/Avengers. The comparisons have obviously been close, but the responses have been pretty split as to whether the brands influence each other or copy each other. Read on for the next comparison thanks to your Twitter votes! The Flash: The Scarlet Speedster first appeared in Flash Comics #1 in January of 1940 in the form of Jay Garrick. The Flash has the abilities of superhuman speed, agility, and stamina, electricity manipulation, intangibility through molecular vibration at high velocity, time travel and dimensional travel via cosmic treadmill. Now some of the character’s powers have varied depending on the specific character donning the role. The character has gone through different interpretations as most are familiar with Jay Garrick, Barry Allen, Wally West, and Bart Allen. The comics have had some great adaptions in the form of the early 90’s series, The Flash, that spanned a twenty-two episode season, the current CW series, and the highly debated cameo in BvS and role in Justice League. Outside of Batman and Superman, I would guess that The Flash is one of the most well-known characters from DC even among common viewers. Add in games, toys, animated movies, etc., The Flash has had a good deal of exposure over the years and is either seen in stand-alone comics, or as one of the founding members of The Justice League. First, let’s focus on Jay Garrick. Originally he was part of the Golden Age heroes who was created by Sheldon Mayer, Gardner Fox, and Harry Lambert. The Flash Companion revealed that his name interestingly derived from Germanic “ger” which means spear and “ric” which means power. At his max speed, Jay Garrick was said to look like a spear of power, aka lightning. Jay is derived from the Sanskirt “jaya” which means victory. Pretty cool, right? The first two comics featuring the speedster labeled him “The fastest man alive” and subsequent comics changed many of the adjectives until “The Fastest Man Alive” stuck. Even though Flash Comics had our hero in the title, he was not the only superhero in the 64-page issues. Many of the other Justice Society of America characters featured as well. All-Star Comics #2 invited readers to take a poll asking readers to vote on the character who should receive their own solo quarterly title. All-Star Comics #4 announced that The Flash would be receiving his own title. Part of the reason for his popularity was due to the fact that he was the most believably written superhero of the 1940s. Jay Garrick’s original antagonists were not the super-powered villains we know from the Barry Allen and Wally West days, but common gangsters, kidnappers, thieves, etc. that he would have had no trouble dealing with. The Golden Age Flash would face meta-type characters later in his series. Around WWII, The Flash had run its course and was either canceled or moved into another genre, which was when most of the Golden Age characters came to an end by the ’50s. Showcase #4 (October 1956) marked the first appearance of the Silver Age Flash, Barry Allen. Garrick made his miraculous return in The Flash #123 — Flash of Two Worlds, which is extremely well known from its cover art which prompted the creation of Earth 2, which Garrick was now from, while Barry Allen would be The Flash from Earth 1. Now a quick note about Barry Allen. How did he become successful when most superheroes had faded in the mid-50’s? Well, a majority of comic characters focused on Cold War rhetoric, which readers were not interested in. Barry Allen’s Flash was different. Showcase #4 was lightning in a bottle (sorry, not sorry for all of the puns) which saw the revival of The Flash and created a new era of superheroes that DC would usher in eventually leading to the Justice League formation. Quicksilver: Pietro Maximoff first appeared in The X-Men #4 in March of 1964. Maximoff has the abilities of agility, duplication, enhanced mutation, stamina, super speed, and unarmed combat. Quicksilver was originally viewed as a nemesis for the X-Men and has continued to walk a fine line turning more into an anti-hero than hero in some interpretations. Maximoff was created to be another reluctant superhero in the likes of Spider-Man and The Thing according to Marvel Year-By-Year. He has aligned with multiple factions. He is probably currently most well known for his role in the X-Men: First Class series of films with his awesome speed/slow motion clips mixed with nostalgic music. He is a man trying to live outside of Magneto’s shadow. Combine this with his quick-temper, impulsive decisions and rash actions, Quicksilver is constantly working towards balance in life. These inconsistencies in his life are reflected in his inability to stay with one faction. He has been seen individually, teamed with his sister, a part of The Brotherhood of Evil Mutants, X-Men, X-Force, Avengers, etc. Quicksilver is a man trying to find balance in the world he lives in. According to ChomicChron, a look at the January 2019 comic sales showed the Flash comics shipped an estimated 40, 596 while Quicksilver usually doesn’t have a consistent solo running comic because he is usually involved as a support character in other name comics, but did somewhat recently have a mini-series titled Quicksilver: No Surrender. The GoogleTrends chart below reinforces that the exposure a character gets, relates to their overall success. The Flash has not only been revamped over the different ages, but has also had some type of consistent show, animated film, etc. that keeps the character in the public eye. Here we go with another comparison of character team-ups! Doom Patrol: The Doom Patrol’s original squad consisted of The Chief, Elasti-Girl, Negative Man, Robot Man, Mento, and Beast Boy. Like most teams, characters have been added, or left over the years. Doom Patrol has found recent exposure, and success with their small screen appearance on The DC Universe which has earned a certified fresh rating of 94% on Rotten Tomatoes. Originally created in June of 1963 by Arnold Drake, Bob Haney, Bruno Premiani, the group first appeared in My Greatest Adventure #80. They were created in response to the “clean-cut” nature of their predecessors The Justice Society and The Justice League. DC wanted a group of misfits to work as a foil to their other established team-ups. This group sees their abilities as a curse rather than a blessing. 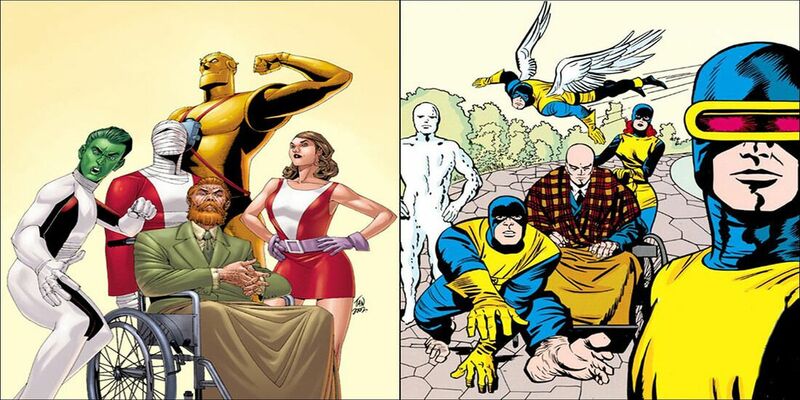 DC killed off the team in 1968’s Doom Patrol #121 while X-men stayed in limbo during the dark days of comics. This was a bold move at the time because Doom Patrol had a loyal following (which is now comprised into five volumes in a DC Archive), and was extremely unique to kill off not just one character, but an entire team in one final episode! Writer Paul Kupperberg and Joe Staton revived the squad 1977’s Showcase #95, but the revamp didn’t focus on the team’s oddness like before and more on their powers which didn’t carry as strong of a following as the revamped X-Men by Chris Claremont. The real revival of the team was in 1989 when Grant Morrison took over and made a parody (or did he copy?) teams such as X-Force and other characters such as Punisher. The series died off somewhat again, and picked back up in 2004 with another reboot by John Bryne and then again in 2016 by Gerard Way of My Chemical Romance, which is probably why it has not held up as well as X-Men who have enjoyed more consistency, especially with their increased exposure in the 90s (the animated series is still amazing). X-Men: The team originally consisted of Professor X, Angel, Beast, Cyclops, Iceman, and Marvel Girl. The team has clearly grown with characters coming and going throughout the years, but the foundation has stayed fairly intact. X-Men were filled with numerous metaphors and allegories especially focusing on racial implications. Professor X’s vision was that of harmonious human-mutant coexistence reflected Dr. Martin Luther King Jr. while Magneto’s strong defense of mutantkind was more along the philosophy of Malcolm X. The Sentinels were introduced to reflect the increase in black Americans being the target of white police officers. In a comparison of current comic sales, Doom Patrol did not produce any results for the month, but Uncanny X-Men shipped an estimated 52,365 units. By looking at the last few article comparisons, there looks to be a strong correlation between character exposure, whether it is on film, TV, toys, etc. and comic sales with the success of the character. X-Men have had feature films with X-Men (2000), X-2 (2003), X-Men: The Last Stand (2006), X-Men Origins: Wolverine (2009), X-Men: First Class (2011), The Wolverine (2013), X-Men: Days of Future’s Past (2015), X-Men: Apocalypse (2016), and the upcoming Dark Phoenix (2019) as well as mentions in Deadpool (2016) and The New Mutants (2019). Those are just the films which have had the characters in the spotlight for a consistent 19 years. Looking at the GoogleTrends chart below, X-Men have been consistent, but spiked around the time a new film was released, and Doom Patrol had its only spike with their new show. RELATED — Aquaman v. Namor, Justice League v. Avengers | Inspiration Or Ripoff? With Captain Marvel just hitting theaters, and Shazam about three weeks away, I will be doing a comparison between Captain Marvel, Shazam, and Superman in the week leading up to Shazam‘s release. Next week I was considering taking a look at some of DC and Marvel’s handicapped super heroes and why they were created. The comparisons would be Doctor Mid-Nite/Daredevil who were both blind and The Chief/Professor X, both wheelchair-bound. Would you like to see those characters or other? You can vote in the Twitter poll, or add names in the comments section. What other DC/Marvel comparison would you like to see? What do you think of this week’s comparison? Whether you think they inspire each other or are rip-off’s it has been fun for me to do some research regarding how these characters got their start and what it is that keeps them lasting. What other characters would you like to see compared? Leave your thoughts in the comments, and thanks for reading!